The late Charlie Haughey did not miss a beat when he was asked how he felt about Ireland getting more than £5 back for every £1 contributed to the EU coffers. “Well, it’s not half enough,” he quipped, as he launched his own lavish Irish six-month EU presidency term in January 1990. Ireland has taken in something of the order of €50bn since we first joined the then-EEC in January 1973. Much of it went to the Irish agri-food business. But from the late 1980s onwards, there were also generous EU regional and social fund grants totalling over €1.2bn per year, every year, for the decade 1989-99. Too often Irish political leaders lazily sold Ireland’s EU involvement to the electorate as ‘free money’ and the country became the trade bloc’s “amiable pickpocket” infamous for extracting optimal aid levels for all sorts. Then something remarkable happened in 2014 which went almost entirely unremarked. It turns out that Ireland actually contributed €200m more than it got that year. And that trend has continued, with an expectation that Ireland will have to stump up some €400m more in the coming years as its contribution to plugging the UK post-Brexit EU budget hole of some €10bn per year. Irish people get it that EU grants, be they ever so generous and welcome, are not the central benefit of membership. It’s about trade access which also generates inward investment and jobs. It’s also about the great under-sold benefit of cultural and educational links. Among the many and varied downsides of Brexit, today we find another. We will have little choice, if we slide towards a situation where the UK exits the EU without a deal, but to seek immediate and significant aid from Brussels once more. 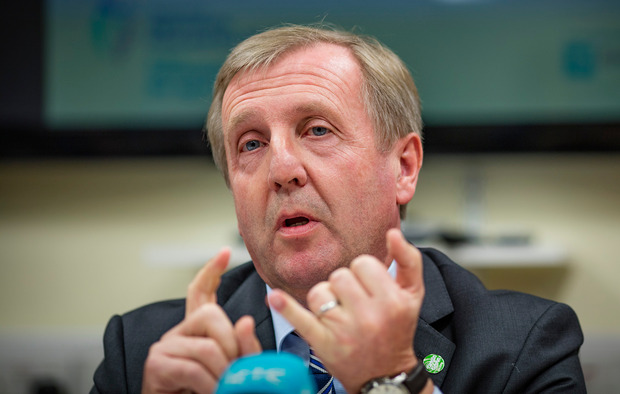 Agriculture Minister Michael Creed is the last person at Leinster House that you would associate with hype. And he is talking about Ireland’s need for “mega money” due to the fallout for Ireland’s beef sector and the dairy industry, coupled with the potential loss of one-third of the value of Irish fishing vessels’ catch in UK waters, accounting for 60pc of mackerel and 40pc of prawns. He says the Government has paved the way in Brussels by putting them on notice. We are facing a pretty fraught period between now and March 29 – but if a hard Brexit happens inside the coming 12 weeks, an Irish aid application will be tabled in early April. What are the odds on that? Well, unless the UK’s MPs can untangle themselves from their current deadlock, it is where we are headed. There is not a majority at Westminster for a no-deal Brexit. But neither is there one for any of the alternatives. Yet again we’ll look to London from next week in hopes they can see a semblance of sense.